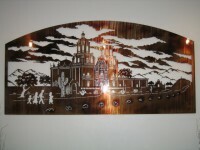 Beautiful rendition of the famous San Xavier Mission. We carry the mission scene in two different sizes 4' x 2' Small($350) and an 8' x 4' Large($1,200). Constructed with a 1" square tube frame to support the artwork.